By taking proper care of your mouth, you will find that it benefits the rest of your body. Proper oral hygiene really does impact more than the look of your smile and the freshness of your breath. The benefits of brushing and flossing extend across the entirety of the body. A healthy mouth can reduce the risk for serious health issues ranging from strokes to heart attacks, diabetes and beyond. The mouth's health and activity is a window into what is happening with the rest of the body. Diabetes, AIDS and other systemic conditions are often noticeable in the form of oral problems. Your dentist and doctor can tell plenty about your health from a test of your saliva. 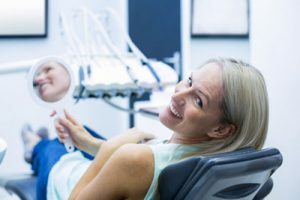 If you have a steady string of oral health problems, it is a sign there might be an underlying health condition contributing to your tooth and gums issues. Bad oral health heightens the chances of heart disease. The bad oral health will eventually inflame after exposure to bacteria. This bacteria gradually builds up to the point that it leads to periodontal disease. This bacteria also has the potential to enter the bloodstream, leading to an accumulation of plaque in the arteries. This plaque will harden and block the arteries. Such a hardening is known as atherosclerosis. This health problem can lead to blood flow issues, complete blockages and a heart attack. The impact on the blood vessels and arteries can cause hypertension and increase the chance of a stroke. It is also possible for poor oral health to lead to endocarditis. This condition occurs when the heart's lining has an infection. In the worst case scenario, it can prove fatal. Poor oral health can impact the respiratory system. Bacteria within the mouth stemming from infected teeth can be sucked right into the lungs. This bacteria can also move to the lungs by way of the bloodstream. The presence of this bacteria in the lungs can cause respiratory infections, COPD, acute bronchitis and pneumonia. It is even possible for bad oral health to impact the brain. When gums are inflamed due to infection, substances are released that can destroy brain cells and cause memory loss. Gingivitis has the potential to lead to dementia as well as Alzheimer's disease. This occurs when mouth bacteria moves through the nerve channels or makes its way into the bloodstream. Gum disease has been linked to cancer. As an example, those who have poor oral health face a heightened risk for pancreatic cancer, kidney cancer and blood cancer. Those who have poor oral health will be that much more likely to develop diabetes as gum disease spurs egregiously high blood sugar levels. Periodontal disease will make diabetes that much more challenging. The symptoms only worsen as blood sugar levels are altered. Request an appointment in our Palm Desert dental office here: https://robertdaddiodds.com. Call us at (760) 394-3088 for more information from Robert Daddio D.D.S. & Associates. Which Foods Can Cause Tooth Decay?